"This creamy mushroom and pesto sauce is an easy dish to prepare, inspired from Seattle's Poor Italian restaurant. It is excellent for entertaining. It is best served hot from the stove!" I thought the dish was flavorful- but the sauce wasn't as creamy as I would have preferred. My husband was very impressed with the dish. very good!! used fat free cream cheese and it turned out wonderfully! I made the recipe as written. Very quick, easy and tasty. I'll make it again. Thanks. Used regular button mushrooms and liked it just fine. Also, I used heavy cream instead of milk. A little bland but still good. read earlier reviews and added more cream cheese and pesto. 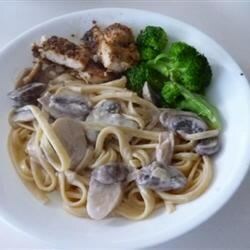 Pretty good recipe I used it with fresh mushroom fettucini.